Such a great outfit! What I like most about it is the gorgeous pulsing color through your gloves, and how beautifully they blend with the beige leather sleeves! Excellent! Felicitari!!!!! Romancele sunt cele mai stilate femei!!!! I love your gloves and your bag. Kisses. Impeccable styling! Love your clutch and gloves! You’re gorgoeus once again my dear! Thank you for being such an inspiration to me! lovely ! great color blocking, youre so good at it ! Wow, very beautiful look! Wonderful! Love the layering and pop of color! You look great! Love the leather sleeves with the fur snood – wonderful mix of textures here! Amazing outfit! Love your tunic dress! Cat imi plac pantalonii albi si manusile!!! Lovely like always! You have a nice blog, i hope you visit my blog!! This is incredible piece, so unique, I really like it especially fur detail! U styled it fantastic hun!! Lovely outfit, once again! Those orange leather gloves look nice, I usually go just with boring black leather gloves, but those really look very nice! Gorgeous! Would you like to follow each other sweetie? u’re so cute;) very nice pics!! That red bag really POPS! You always look so amazing! WOW! Love this hi/low mix! I literally went through your outfit and swooned at all the picks! Such affordable pieces that look ultra luxe paired with sumptuous leather…Brilliant move! Love the mix of colours in this outfit! And love your hood!! I always like the way something in the photo the color components from the street and the details of your clothes! Tempting! amazing colors the look is gorgeous love the gloves! amazing photos! Spectacular outfit! I love the tunic!!! You did a beautiful job styling this outfit, I love the tunic! Tank you for the sweet comment dear! Don’t miss my pini spring giveaway! fantastic pictures ! I love your gloves ! I love this look, very stylish. Everythying is so nice. Honey you look so beautiful, love the style, love the colors! I just love your style and immediately bloglovin you hun! wonderful image! It is a harmonious combination of black and white, diluted with bright spots! 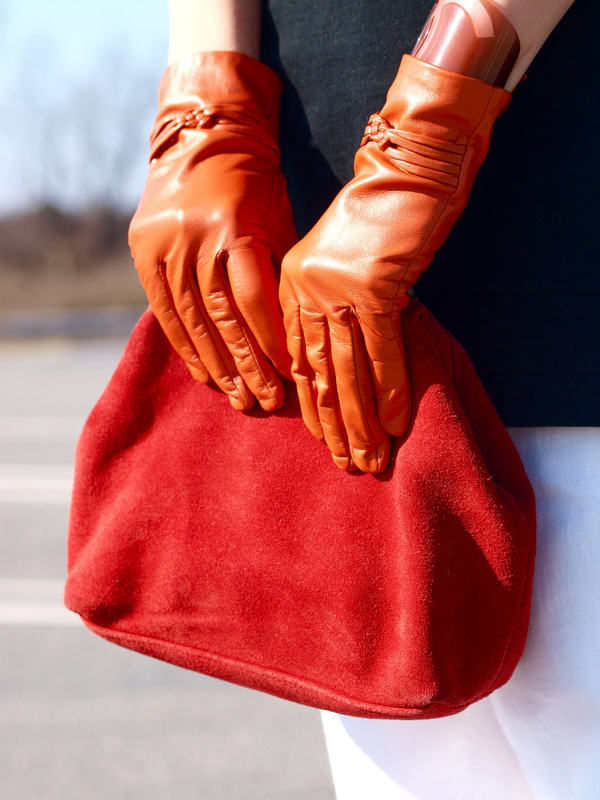 A combination of red and orange leather bag gloves – it’s just adorable! Wouw! !Thank U for your comment! I follow you, great mix, I love your outfit! Le col est super ! you look SO chic. love your bag! That is such an awesome outfit! love your leather gloves, incredible colour! it’s just perfect! !love it once again! !colours are perfectly matching and your fur is absolutely amazing the way you wore it! !kisses hun! Absolutely loving this look, especially the leather sleeves and the warm colour punch. PAss to me i have a new post!! Wow very beautiful look, classic, chic and trendy !! Love color of your clutch. Really like the layering of the top part and the mix of textures! Thanks for your comment! !your blog is amazing, now i’m follow you! So glam and modern..found you on Asos..following!